In 2011, Mounira Al Solh began a series of drawings that documented her meetings and conversations with displaced Syrian refugees in Lebanon and various European countries. The oral histories she collected are very different from those told in administrative interviews or police interviews. 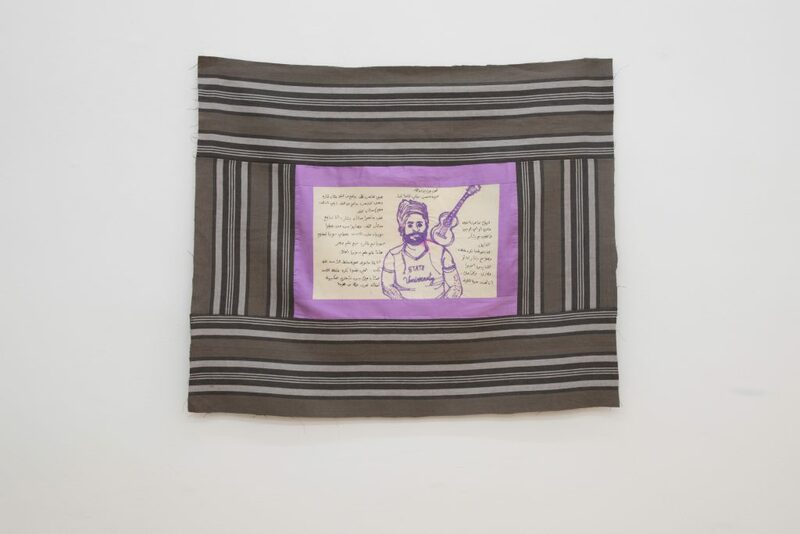 My specialty was to make a peasants’ haircut, but they obliged me work till midnight often(2017) is part of a series of embroideries that speaks to how personal stories in this political context create collective history. The artist’s conversations inspire her to write a few sentences that attempt to get as close as possible to the personality of the embroidered subject. The artist worked collaboratively with immigrant women, establishing a community and safe spaces of listening and dialogue. Embroidery involves an intimate relationship to time and moves away from the more mechanical practices of photography and documentary video. This work is a transcription of a moment recalling the physical and visual relationship that is at stake in a meeting.